Dear cats, stop stealing my coasters! I have a set of coasters that are made of felted wool (knitted by me of course). They are very absorbent and make great coasters. They also attract cats like crazy. In the middle of the night, one of our cats steals the felted wool coasters and leaves them on the floor in the hallway. 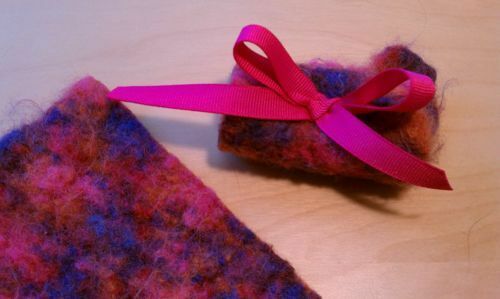 Using a multi-colored wool yarn that had been given to me as a gift, I recently knitted up a rectangle and felted it. Felting rarely turns out a perfect square, so I had to trim the edges to make a coaster. I rolled up the extra felted material, added a bow and call my creation a cat toy. So, dear cats, stop stealing my coasters!